Top 10 Marvel Characters That Would Make Horrible Halloween Costumes. I was getting my youngest son ready for his Halloween Parade at preschool this morning and I started thinking about costumes. One of these days, I’ll have to dig out the Polaroid of my younger self dressed as Captain America with my sweet cardboard shield. Not that that has anything to do with anything. Anyway, I was thinking that some costumes look great and are instantly recognizable to the common folk. And some? Not so much. The cool ones are easy to applaud, so what’s the fun in talking about them? I’m sure when we have the kids out trick-or-treating tonight, that we’re bound to run into endless iterations of Iron Man, Batman, Spider-Man and Hulk. There’ll be a few Jokers mixed into the crowd and maybe, just maybe, someone will have the resources and chutzpah to pull off an excellent Hellboy costume. 10. Radioactive Man: Hmm…a husky, glowing Chinese man in a dress. Sure, I’ve been to some crazy nightclubs in my life and done some things I’m not proud of, but that image is just creepy. 9. Sub-Mariner: It doesn’t take much to slap together a costume consisting of a green Speedo, Spock ears and pillow feathers super-glued to your ankles. That said, it definitely takes a lot to pull the look off…like a body that anyone would want to see in a Speedo. 8. Ka-Zar: I guess I have some sort of subliminal problem with half-naked fanboys, because the idea of a stinky hippie in a loincloth reminds me more of Burning Man than Halloween. The only treat this costume would get at my house would be a bar of soap to scrub off the stench of Patchouli. 7. Razorback: My high school’s janitor may have looked kind of weird slopping up vomit in his green jumpsuit and rubber gloves, but adding a pig carcass and CB lingo to the ensemble is NOT an improvement. 6. Starfox: The costume itself wouldn’t be a difficult thing to produce, but it takes a certain kind of schmuck to believe he can waltz into a bar dressed like that and try to pick up a woman with his “empathy” powers. I predict many drinks thrown in his face. 5. Vulture: Not only do I never need to see a bald old guy in some skintight green jammies, but those big wings would be a logistical nightmare in a party setting. He’d be constantly knocking over drinks and getting stuck in doorways. 4. Madrox: Unless you’re one of a set of quintuplets, there’s absolutely no pulling off this “mutant in jeans and t-shirt” concept. But imagine how freaky that would be if you were! 3. MODOK: I’m not sure if this would be the stupidest costume or the most amazing thing I’ve ever seen. Granted, there would need to be some major “suspension of disbelief” to pull off the hovering bit. It would be pretty hilarious to see MODOK trying to bob for apples with his giant noggin and tiny T-Rex limbs. 2. Professor X: Ooooh. Bald guy in a wheelchair. Original. 1. Ghost Rider: Flaming skull? If you’re gonna go for realism, this one is probably not a good idea. Plus, the motorcycle makes it kind of awkward to mingle. 1986: It Was A Very Good Year. While doing research for our Defenders post, I began to realize that a lot of great (and a few not so great) things were going on at Marvel Comics back in 1986. So here, in a brief and highly disorganized ramble, is a recap of the year that Marvel Comics hit its stride (I think). In 1986, I was making the transition from middle school to high school. It was a tumultuous year. I was saying goodbye to friends that would be attending a different high school and I was filled with anxiety over meeting new people at my new school (our school district is kind of twisted, don’t ask). This was the year that I embraced comics completely and let my paper friends comfort me in the transition. Granted, I had been reading comics since around 1978 and collecting them seriously since 1984, but this one year had it all for me. I wasn’t the only one in transition though. Jim Shooter was running a tight ship at Marvel and the publisher was celebrating its 25th anniversary. However, not everything was puppies and rainbows. Marvel was about to be purchased by New World Entertainment, which looked great on paper and added both an animation studio and a feature film outlet for their characters. Unfortunately, New World didn’t know how to handle the business and soon sold it off to Ron Perelman. The rest of the debacle you can read in Dan Raviv’s excellent book, Comic Wars. So what was the big deal with ‘86? I’m glad you asked. First of all, a couple miniseries hit the shelves that changed the way I looked at the Marvel Universe. Firestar was a character I knew from the Spider-Man cartoons and I was curious as to how they would work her into real continuity. Balder the Brave was an unknown Asgardian to me and I was eager to learn about more than Thor and Loki. 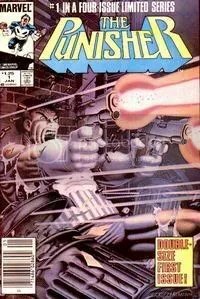 And finally: The Punisher. The team of Baron, Zeck and Janson just blew my mind. At the time, all were minor characters and I don’t think anyone could have predicted what would become of Frank Castle’s story. Aside from the focus on new characters, Marvel was pulling off some of its best ongoing work as well. We had Bill Mantlo writing Alpha Flight AND Cloak & Dagger. Mark Gruenwald’s Captain America run was in full force (as was his Squadron Supreme maxiseries). Walt Simonson was working on what would become an iconic run on Thor. The West Coast Avengers, a pivotal book in my comic obsession, had recently begun their ongoing title. John Byrne was writing AND drawing not only the Fantastic Four but ALSO the Incredible Hulk!?! 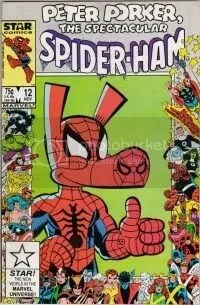 Oh, and Peter Porker, the Spectacular Spider-Ham was still going strong too. Sue me, I like the funny. It wasn’t all joy and excitement for me though. Two of my favorite books disappeared from the shelves forever: The Defenders and Power Man and Iron Fist. Also falling casualty to slowing sales were three licensed books: ROM, Star Wars and the Further Adventures of Indiana Jones (which was actually a great read). Unfortunately, not only was the dreadful Secret Wars II going on in 1986, but the New Universe launched as well. But those travesties were offset by the launch of the new X-Factor series. And the end of 1986 marked the beginning of what I believe to be one of the best written storylines in all of comics history: Roger Stern’s great “Under Siege” run in Avengers. 1986. I can’t think of a better time to be a Marvel Zombie. Interesting that you would pick 1986, and yet, as a Marvel Zombie, you don’t mention The Dark Knight Returns or Watchmen, two seminal mini-series from that time as well. They show up on most people’s lists, but not on yours, since you’re focusing exclusively on Marvel. I know that Maggie Thompson from Comics Buyers Guide has said (and she may not be the only or even the first person to say this) that everyone has their own Golden Age of Comics, and that their personal Golden Age is when they were twelve. I’m not sure that the exact age is always correct, but I agree that the comics of our childhood will always be our favorites, or at least hold a special place in our hearts. It’s obvious that this describes 1986 for you. I also have a special place in my heart for many of these comics, but being a cold, unfeeling android, I can often separate what is good due to nostalgia from what is good due to quality. I wouldn’t dream of arguing the memories of your childhood, so instead of mentioning a few of these series where I disagree with your opinion of them, let me focus on the ones where I agree wholeheartedly. I think Mark Gruenwald’s writing was always underappreciated, especially when one considers that he was doing it while holding down a job as one of Marvel’s best Group Editors. I think that almost all of his long run on Captain America is worthy of reading, but I also agree that he was strongest right out of the gate. His stories involving the Serpent Society and Scourge were excellent. Captain America is, I think, a difficult character to write well, but Gruenwald seemed to understand how to make him inspiring and heroic, without being boring. As Jason says, Gruenwald’s Squadron Supreme was another excellent read, and about fifteen years ahead of its time, looking at a superteam in a more realistic way. Finally, while it came out after 1986, I need to take a moment to plug the first few dozen issues of his Quasar comic. The later issues devolved into overly complicated messes that tied into some truly horrible miniseries, but the early issues were an excellent examination of a super-hero just starting out in his career. I could comment on a few other series, but instead let me take a few moments to mention Roger Stern. You bring up his “Under Siege” storyline in the Avengers, and rightly so, as it remains one of the best multi-issue storylines in Avengers history, and truly in the history of about any comic I’ve read. Why Roger Stern isn’t currently writing four books a month will remain a mystery to me. I consider him one of the best writers I’ve had the pleasure of encountering in comics and I have been continually amazed by what he has been able to do with what have been some truly horrible comics. Two series illustrate this point very well. The first is The Incredible Hulk which he started writing at a time when the book, to my eyes, sorely needed help. The Hulk had been a mindless dolt, running around the countryside having random adventures for what seemed like years. His comic was pointless and dull. Stern came on board, set up a new staus quo, introduced some supporting characters, and give the comic a purpose. He was the first writer in the series history to make the Hulk interesting for me. Sadly, his run on the title was very short. 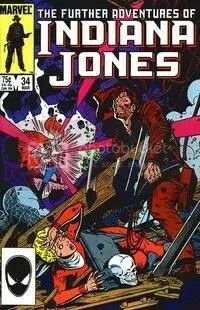 He performed the same amazing feat on the original Ghost Rider series. Ghost Rider’s series had been boring me to tears since Tony Isabella left the title back in the 70s. The stories since then weren’t necessarily bad as much as they were unconnected stories which seemed to blend into each other. Again, the series lacked direction. Stern came onboard, and again, he gave this title direction. He brought in a supporting cast and gave us plots that made us care about these new people in Blaze’s life (and, to be honest, to care about Blaze’s life, which I had stopped caring about some time before). Unfortunately, he again left the title in a short time. Yeah, DC was pretty active in 1986 too. You mention Dark Knight Returns and the beginning issues of Watchmen…there was also the start of solo series for both Blue Beetle and Booster Gold. Crisis on Infinite Earths wrapped up in ’86 and the important Legends series began. And don’t get me started on indie comics…Adolescent Radioactive Black Belt Hamsters, Ralph Snart Adventures and the relaunched Grendel all saw print then. It was a pretty busy year for all comics! I’m not saying 1986 was the pinnacle of comics as we know them (although, not being alive during either the traditional Golden or Silver Ages, I think it was pretty close). Oddly enough, I was 14 going on 15 that year…so not too far off from Maggie Thompson’s ideal. I actually started collecting heavily when I was 12 though. Anyway, yeah I know which of my spotlights — *cough*Firestar*cough* — you’re referencing when you talk about separating nostalgia from quality. But I think I pointed out the reasons WHY I thought they were important and, frankly, it had nothing to do with quality but more to do with coming from a different place and showcasing something new. It’s funny that you touch on Mark Gruenwald. Not too many people know this, but I actually had a letter-exchanging friendship with Mr. Gruenwald around the time of his Cap run. We talked about the changing times in comics and he advised me to read what I liked. I was actually quite upset when I read that he had passed away. And Roger Stern was perhaps my favorite writer of the time as well. Like you, I would call The Avengers my favorite book of all time (I have quite the extensive collection). While I came of age reading his run on the book, I was also active in collecting the back issues featuring runs by Englehart, Conway, Thomas and Shooter. In fact, right now I’m reading Assembled! by the folks at AvengersAssemble.net. It’s a fun read about Avengers history. DK Publishing also put out a pretty book called Avengers: The Ultimate Guide written by Tom DeFalco…beautiful art and brief write-ups of all the prominent members of the team, their villains and the important storylines.